This case study examines Anguniaqvia niqiqyuam (Ung-u-niak-via Ni-kig-e-um) MPA, which was officially designated a Marine Protected Area by the Canadian Government in 2016. The MPA is located around the west side of Darnley Bay in the Beaufort Sea, Northwest Territories, and is in close proximity to the Inuvialuit community of Palatuk, who have traditionally hunted and harvested food from the protected area. Anguniaqvia niqiqyuam is also home to roughly 40,000 Beluga whales (27% of the world’s population), bowheads, numerous seabirds and other wildlife. Traditional Indigenous knowledge was used extensively in crafting conservational goals, and acknowledgement of Indigenous land usage has also been factored into the creation of this MPA. In this way, Anguniaqvia niqiqyuam is a promising example for future MPAs. This study will be observing the collaboration between different actors—examples being the Inuvialuit and the Canadian Department of Fisheries and Oceans—in creating and managing the MPA. It will also be exploring tenure agreements, conservational goals and the cultural significance of this MPA for the Inuvialuit people. 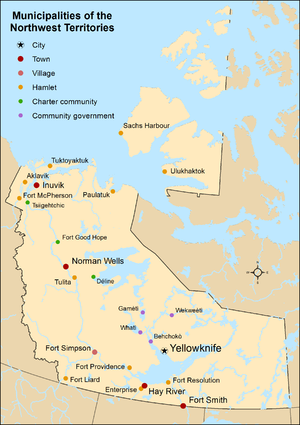 Map of Northwest Territories; Paulatuk Village indicated on the Northern Coastline. By Hwy43 via Wikimedia Commons. CC BY 3.0. Contributions of the area to social and cultural values. The outcome of the screening lead to Anguniaqvia niqiqyuam being deemed by the three communities and other stakeholders as the most suitable area for establishing an MPA. The boundaries of the MPA were crafted with the assistance of members of Paulatuk, using their knowledge of wildlife migration, marine vegetation, hunting and fishing areas, and culturally important spaces as guidelines for consideration. It was nominated by Fisheries and Oceans Canada (DFO), the territorial government of the NWT and local communities of Paulatuk, Ulukhaktok and Sachs Harbour. On November 16th 2016, the area was officially announced as an MPA by the Federal Government of Canada. Thick-Billed Murres. By U.S. Geological Survey via Wikimedia Commons. Public Domain. Belugas: The protection of the area will help sustain beluga numbers, and will provide important opportunities for scientific research and monitoring of the beluga population. This monitoring will give important insight into the overall health of the global beluga population. Thick-Billed Murre: The creation of the MPA would provide protection to the only nesting ground in the Western Canadian Arctic. Arctic Char: the Darnley Bay area is a feeding ground and nearshore migration area for these fish of cultural and subsistence importance to the people of Paulatuk. Commercial fishing of Arctic Char was halted in the region due to diminishing numbers. Polar Bears: In winter, Anguniaqvia niqiqyuam's sea ice provides breeding and feeding grounds for polar bears. The area also holds several important ecological sites, such as: deep water holes in the Hornaday river estuary where the Arctic Char overwinter, ice-edge habitats during spring, and kelp beds which are potentially unique to the Beaufort sea area. Anguniaqvia niqiqyuam is of cultural importance to the people of Paulatuk, as it is their traditional hunting and harvesting territory—much of their history is tied directly to the area. The ability to transmit traditional knowledge (such as of hunting and land-based practices) though generations is crucial to the survival of Inuit communities; particularly in light of the history of residential schools, the oppression and diaspora inflicted on Inuit people by the Canadian government. The people of Paulatuk rely heavily on sustenance harvested or hunted from the MPA due to the remoteness of their community; as food and other supplies need to be brought in via boat, the cost of basic foodstuffs is exponentially higher than in the rest of Canada. Another consideration is the cost of keeping food in fridges or freezers as opposed to traditional methods of preserving food that was hunted or harvested. The traditional method is much more affordable and sustainable for members of their community and helps them maintain ties to their history and culture. As there are few economic opportunities for members of the community due to its remoteness, many of the livelihoods of adults within the community come from hunting or fishing. Rapid environmental changes within the Arctic region could lead to an increase of opportunities for socio-economic activities with potentially detrimental effects to the environment. For example, warming of the climate leads to less ice and longer open-sea seasons, which would allow for increase in shipping, resource exploitation (such as for oil and gas), more commercial fishing and tourism. An increase in these activities would pose a great threat for the biodiversity and ecological functions of the area. Inuvialuit Settlement Region (ISR). By Inuvialuit Final Agreement & Western Arctic (Inuvialuit) Claims Settlement Act via Wikimedia Commons. Open Government License Canada 2.0. Darnley Bay and the community of Paulatuk fall under the area of Treaty 11, a treaty established between the King George V and Indigenous communities across the NWT, signed between 1921 and 1922. A renegotiation of the treaty, finalized on June 5th 1984, is known as the “Inuvialuit Final Agreement”. This agreement established the ISR as land designated specifically for the Inuvialuit people's usage; that in exchange for the Government claiming title to the land, Indigenous people’s rights to traditional land usage, such as trapping, hunting, and fishing are legally secure within certain guidelines. The agreement states that the “Inuvialuit will receive ownership to the beds of lakes, rivers and water bodies, subject to a 100 foot access strip around the seacoast and shorelines of navigable waters for travel, recreation and emergency purposes”. In all cases, the Crown holds ownership over the water. Although the state holds statutory ownership of the MPA's waters, the people of Paulatuk have legal rights to access the MPA and engage in traditional and sustainable harvesting or hunting. A consideration which helped ensure Anguniaqvia niqiqyuam's MPA status is the region's lack of overlapping tenure claims. Within the area, the only “current, non-renewable resource sector… is mining.” Parry Peninsula, adjacent to the MPA, hosts a geological anomaly which is believed to be rich in copper and nickel. There are two companies—Diadem Resources Limited and Darnley Bay Resources Limited (now Pine Point Mining Limited)—which hold mineral rights to the area, but these rights do not overlap with the boundaries of the MPA. “Commercial fishing in the area has been closed since 1986 due to a population decline of Arctic Char, and is unlikely to develop in the near future…” Because of this, the MPA does not impose any extra costs on the commercial fishing sector as there is no foregone revenue or “higher costs of operation”, and there is unlikely to be any tenure conflicts in this sector. Anguniaqvia niqiqyuam is within the boundaries of the Beaufort Sea Large Ocean Management Area (LOMA), “one of five priority areas identified for integrated ocean management planning by the Government of Canada.” The areas within LOMA are under “integrated management”, a collaborative management and planning process lead by the DFO and which operates through several levels of regional governance. 1) There are “working groups”, which are the ‘on the ground’ management worker; the lowest tier of management created by the Regional Coordination Committee (RCC) as they are needed for particular causes. These groups research and construct foundation pieces on which ocean management plans for sustainable development is based. They include experts from BSP organizations. There are Working Groups focusing on community consultation, traditional knowledge, biophysical issues/natural sciences, and more. 2) There is the Beaufort Sea Partnership, to which the Working Groups refer and send their findings to. The BSP builds on the findings of the Working Groups the create management plans, which then continue up the chain to the RCC. 3) There is the RCC, to which the BSP refers to and which is the top tier of regional management overseeing the area under which the MPA falls. Any activity within the MPA from actors outside of the village of Paulatuk requires a permit issued from the Department of Oceans and Fisheries (DFO). In order to have an Activity Plan approved, a form detailing the activity and its purpose must be submitted to the Minister of Fisheries and Oceans for approval 60 days before the proposed activity. There are three separate management plans operating within the MPA. 1) Beaufort Sea Beluga Management Plan: this plan is a joint effort between the DFO, the FJMC, Hunters and Trappers Committee (HTC) and the Inuvialuit of Paulatuk and other communities. It aims to protect the beluga population long-term while maintaining sustainable harvesting of belugas by the Inuvialuit. It facilitates co-operative monitoring of the belugas by the Inuvialuit, HTC, FJMC and DFO. Under the Inuvialuit Final Agreement, they also have statutory rights to access and and continue to use the MPA's resources. ⅔ of the adult population of Paulatuk engage in hunting, fishing or harvesting from the MPA to supplement their livelihood due to the remoteness of the community. Their goals are to preserve and protect the ecological and biological integrity of Anguniaqvia niqiqyuam, while maintaining their rights to hunting and harvesting from the land. Although other stakeholders worked closely with Paulatuk in the creation of the MPA and continue to do so in managing the MPA, the village holds a relatively small amount of power due to being such a small and marginalized community. The DFO is an interested stakeholder in the MPA. The federal department manages Canada’s fisheries, oceans, and freshwater resources. It is a part of the Integrated Management Plan in the Beaufort Sea, which is rooted in “developing international ocean governance processes and Canada’s ocean related international commitments”. The DFO holds the most power of all the stakeholders within the MPA, as it is the stakeholder closest to the government, and the stakeholder which receives funding from the federal government for the creation and management of the MPA. The DFO was confirmed in the 1997 Oceans Act as the lead federal authority for oceans. Their goals were to choose an ecologically and culturally significant area that would benefit from the protection of an MPA, but would also not cause losses to economically important departments within Canada—for example, creating an MPA where there is highly profitable commercial fishing taking place, or where oil or gas are already being extracted. The DFO sits on the Regional Coordination Committee (RCC). The FJMC is an interested stakeholder in the MPA. The FJMC is a “co-management” organization which “works jointly with the DFO to co-manage all with, fish habitat, and marine mammals within the ISR.” On the committee two members are appointed by the Inuvialuit (Inuvialuit Game Council), two are appointed by the Government of Canada (through Orders in Council), and the chair of the committee is selected by the appointed members. The FJMC works jointly with the DFO and also sits on the RCC, but has less relative power. For example, the FJMC has the power to directly advise the Minister of Fisheries and Oceans on fisheries issues, but the DFO holds the final call on decision making. The FJMC is in charge of the Beaufort Sea Beluga Management Plan (BSBMP), which is in operation in the Anguniaqvia niqiqyuam MPA—the plan focuses on ensuring that the beluga population is maintained at a thriving level and to “provide for optimum sustainable harvest of beluga by the Inuvialuit." As Anguniaqvia niqiqyuam hosts such a large number of migrating belugas annually, the protection of the area is integral to the research for the BSBMP and for the implementation of the management plan. The IRC is an interested stakeholder in the MPA, and there are some affected stakeholders within the IRC as community members of Paulatuk are involved in the corporation. The IRC was developed in 1984 to manage the settlement between the Federal Government and the Inuvialuit people outlined in the Inuvialuit Final Agreement. The IRC holds some power over what occurs within the MPA as it sits on the RCC, but like the FJMC it differs to the DFO. The IRC “Represents the collective Inuvialuit interests in dealings with governments and the world at large...to continually improve the economic, social, and cultural well-being of the Inuvialuit” These goals, and the fact that the IRC represents the community of Paulatuk to the government, means that they have a vested interest in the success and maintenance of the MPA. The BSP is the “primary forum for stakeholder engagement in integrated ocean management of the Beaufort Sea Large Ocean Management Area, with broad stakeholder representation from 54 different organizations”. This forum represents a wide variety of interests and stakeholders, and as such it is difficult to pinpoint what their any particular interest in the MPA may be. They make recommendations to the RCC, but they are a tier below the members of the RCC in terms of the amount of power held. The MPA appears to be a success story, although it is still a new creation and as such it’s state and progress can be difficult to assess. However, there appears to be no conflict between actors within or over the MPA, and there has been documented progress made on the study and protection of belugas and other marine wildlife within the MPA. The rights of the people of Paulatuk have also been respected, and they remain involved in the MPA as key stakeholders. The creation and management of the MPA interwove scientific knowledge with traditional Inuvialuit knowledge, and worked closely with the affected stakeholders (the people of Paulatuk), which makes it an important example for future MPAs. ↑ "Inuvialuit Settlement Region". Joint Secretariat. ↑ 4.04.14.24.3 Chambers, MacDonell, C. , D. (December 2012). "Ecological Overview and Assessment Report Anuniaqvia niqiqyuam Area of Interest" (PDF). Beaufort Sea Partnership. p. 3. ↑ 5.05.1 "Traditional and Local Knowledge Workshop for the Paulatuk Area of Interest" (PDF). Beaufort Sea Partnership. September 2012. ↑ "Anguniaqvia niqiqyuam Marine Protected Areas Regulations". Canada Gazette. ↑ 7.07.1 "Beaufort Sea Beluga Management Plan" (PDF). Beaufort Sea Partnership. ↑ 9.09.19.29.39.49.5 Chambers, MacDonell, C., D. (December 2012). "Ecological Overview and Assessment Report Anuniaqvia niqiqyuam Area of Interest" (PDF). Beaufort Sea Partnership. ↑ Coates, Morrison, Kenneth S, William R. (1986). "Treaty Research Report - Treaty No. 11 (1921)". Indigenous and Northern Affairs Canada. ↑ 12.012.1 "Inuvialuit Final Agreement". Inuvialuit Regional Corporation. ↑ 13.013.1 "Summary of the Inuvialuit Final Agreement" (PDF). Inuvialuit Regional Corporation. ↑ "Beaufort Sea Large Ocean Management Area". Beaufort Sea Partnership. ↑ 15.015.1 "Governance - Beaufort Sea Partnership". Beaufort Sea Partnership. ↑ "Anguniaqvia niqiqyuam Activity Plan". Beaufort Sea Partnership. ↑ "Anguniaqvia niqiqyuam Marine Protected Areas Regulations". Justice Laws Website. ↑ "Paulatuk Community Conservation Plan" (PDF). Screening Committee. ↑ 20.020.1 "Traditional and Local Knowledge Workshop for the Paulatuk Area of Interest" (PDF). Beaufort Sea Partnership. September 2012. ↑ 21.021.121.2 "Regional Coordination Committee". Beaufort Sea Partnership. ↑ "Integrated Oceans Management Plan". Beaufort Sea Partnership. ↑ "Canada's Oceans Strategy". Fisheries and Oceans Canada. ↑ 24.024.1 "Fisheries Joint Management Committee". Joint Secretariat. ↑ 26.026.1 "Community Corporations". Inuvialuit Regional Corporation. ↑ 27.027.1 "About IRC". Inuvialuit Regional Corporation. 2018. ↑ "Beaufort Sea Partnership". Beaufort Sea Partnership. This conservation resource was created by Simone Miller. It has been viewed over 0 times.